Holy schnikies! It’s August already, and here I am, having fallen behind on posting. I have no idea where this summer has gone, although I know where I’ve gone, and those places have been many, far and wide. It has been a great summer, aside from that whole having to work thing that I’ve got going on right now. I love going on vacations, and traveling with my Fuzzy Huzby is always an adventure! And since I’m a little behind, I think I’m going to do mostly a pictorial post today about some of our summer travels. First up was the family reunion that we went to in Durango, Colorado. Every couple of years or so, my dad’s side of the family (the Koski’s) get together for schmoozin’ and boozin’. This summer, my Uncle Paul and Aunt Renee, who live in Nucla, Colorado, picked Durango for our clan’s gathering. It was a short weekend, but Chris and I packed in a lot of action and adventure! Everyone who made it to Koski-palooza 2013. 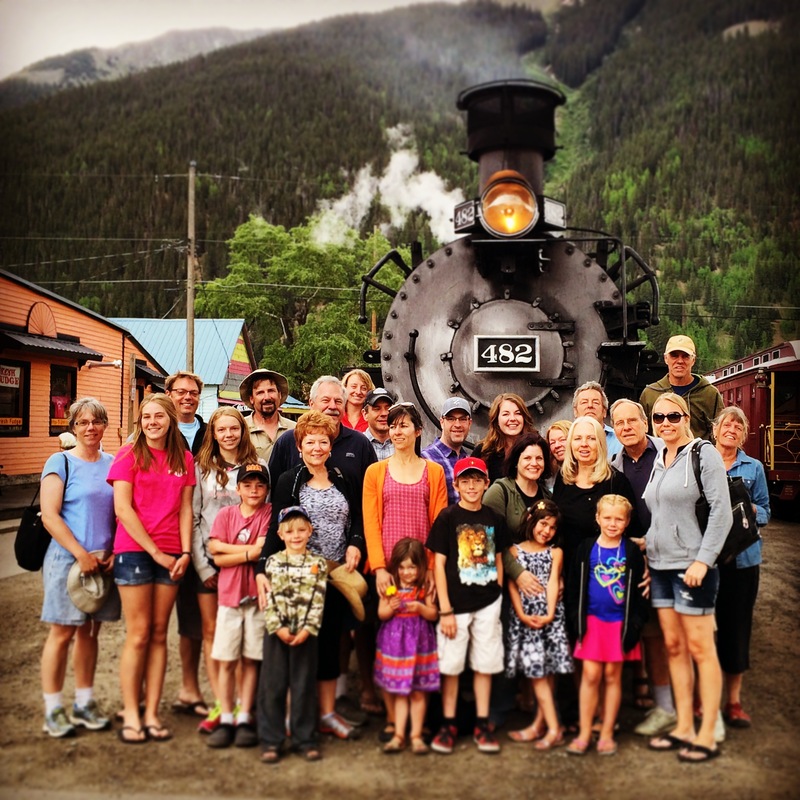 The next day, the whole family took the historic narrow-gauge train from Durango to Silverton, which largely followed the Animas River between the two towns. It’s about a 2.5 hour ride each way, so I occupied my time taking selfies with various people, drinking smuggled Fireball Whiskey with my cousins on the DL, and enjoying the fresh air (which was nicely flavored with freshly burned coal from the steam engine, cough cough cough). Want to see some pictures? Great! I have some! It was a really enjoyable trip, but I must say, it was way too short. I feel like I didn’t really get a chance to talk with many people, other than the usual pleasantries and quick updates. I did spend some time hanging out with my Aunt Tje, which was great because I think we’re both somewhat introverted and share some things in common. And, it was really awesome hanging out with my cousin Heidi for the day – I love that she’s grown into such a smart, fun and laid-back young woman! Colorado, and especially Durango, is a beautiful place and I realized that I do miss that landscape. Another successful family reunion…check! « I will Literally FIGHT to Photograph the Empire Builders! I’ve seen lots of lizards but never one so multi and brightly colored. Can’t wait to see where else you’ve traveled. I’m a homebody this summer but enjoying (almost) every day:-). Big Fuzzy Hugs! I skipped Mesa Verde after spending too much time in Moab on my southwest tour in May. Thanks for the vicarious tour (which is way better than the one I would have had with three dogs and a parrot in tow!) I love. love. love trains, especially historic trains to ride just for the sake of riding. I am going to pretend that I did not read about the National Park Passport app here so that you cannot be blamed for a new obsession that may cause loss of job, income, marbles, etc.